Are you searching for an excellent artist for your next event ? At your preference Pablo is your living doll, your futuristic robot or takes center stage of your event. Pablo Zibes, who was born in Buenos Aires combines motion, slow motion and „no“ motion into an extremely versatile show enjoyable for people of all ages. About the art of pantomime. Questions posed to pantomime Pablo Zibes from Stuttgart about the art of pantomime and walk-about acts. The beginning as a pantomime. | How and why did you decide to become a pantomime? I always like pantomime but I started out as a theater actor. Already as a child, my parents often took me along to theater productions. At the age of 15 I took my first intensive theater course. Later I attended the school of acting in Buenos Aires. Parallel to my acting training I made my first experiences doing pantomime. At 22 I undertook a yearlong travel through Europe and Asia. To finance my journey I developed a show employing the most international of languages, the language of pantomime – movement. This was the start of my use of pantomime techniques, which I then used for walk-around entertainment acts. The first international experiences as a pantomime | How did it come to this first tour as a pantomime? An important motivation for my travel and to encounter foreign cultures was my wish to push my own borders. Until then I only had experience performing on stage and on TV. I didn’t know yet how to perform on the street and where one must first attract and keep the audience. It’s easy in a theater because the people are there to see you. In addition was the difficulty of being alone and in unfamiliar cultures. My first performance as a street pantomime was a challenge of bravery. I still remember how nervous I was in those days on the streets of Madrid. It was carnival time and I said to myself; “the people are satisfied and besides many are themselves in costumes. This is the ideal opportunity for my first attempts as a pantomime in the street.” On this evening, I painted my face and went on the street. Unfortunately, the routines I had rehearsed did not work well in such a situation so I began to improvise and adapt my performance. And it worked! And so it happened. I went on to travel through different countries in Europe and Asia working as a mime. Influences to my present work as pantomime and walk-around entertainer. 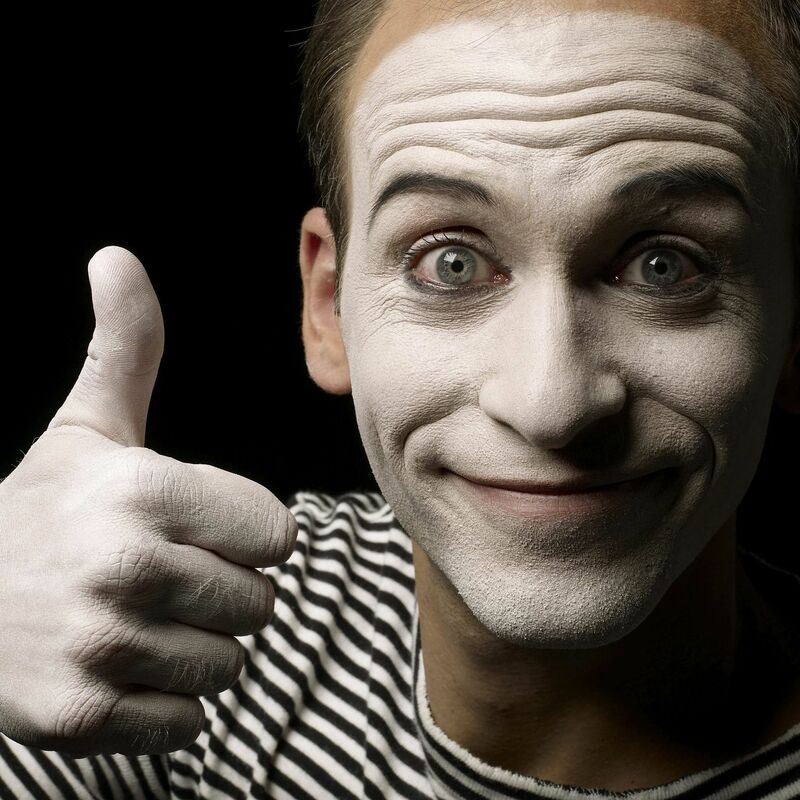 | What significance did these experiences have for your work as a mime? I had the opportunity for a whole year to perform in different countries. I profit even today from what I learned back then even when I am on the stage as a pantomime or mingling among my audience at an event. Especially for trade shows or conventions or doing walk-about entertainment, the setting has many parallels to working in the street. One needs to quickly and reliably read the body language of the participants to determine how best to effectively relate to and entertain them. Another important aspect is the use of improvisation. This doesn’t mean that one doesn’t know what to do. Rather the opposite; one has the ability to immediately react and do the right thing even in unexpected situations – something that comes up again and again. The reactions of audiences to a pantomime will always vary. I’ve thought out a whole library of possibilities, which grows with experience, on how to react fittingly. I have to take each and every one of my public serious and make sure I don’t go too far with my actions. Certainly my world-wide experiences help me by all of my performances for events with international guests. The essence of pantomime. | What meaning does pantomime hold for you? Both body language and gestures are the basis of human communication. Obviously, they are older than spoken language. And they have survived today to be part of modern communication. One sees this in the need to gesture as soon as we telephone despite the fact that the hearer cannot see it. We just can’t leave it aside. Another interesting example is the “emojis” used in text messaging or “smilies” in emails. We use these symbols to convey feelings with a simple expression or gesture. In a similar way, mimes use gestures or body language to communicate. The art of pantomime is to convey not only the deepest of emotions but also situations, places, life forms or objects. A good mime brings his public into a world where there can be no misunderstanding or limits of language. This is not something limiting. On the contrary, he brings across his message in a new and limitless way. I think that the mimes’ methods are a shortcut. Word can be misunderstood and mislead or lie. This rarely happens with body language, which is harder to fake. It’s pretty complicated for a pantomime to lie. Some quotes by Marcel Marceaus, one of the world’s most famous mimes. These characteristics are not limited to mime. One sees them as well in dance and music.